Bring the tomatoes and water to a boil then add the rice, the cumin, chili powder, red pepper flake and salt and pepper and reduce heat. Simmer covered until the rice is fully cooked (check the cooking instructions on your rice — you may need to add more water to get the rice just right). 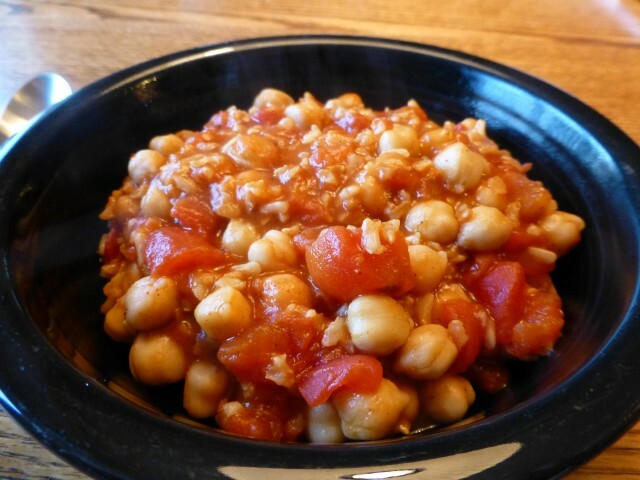 Once the rice is fully cooked, drain and rinse the chickpeas and add to the soup. Cook on medium heat for 15 minutes or until the chickpeas are warmed through. Serve as a meal itself or with a meal as an accompaniment. This soup makes at least three meal sized servings. Honestly, I really dig this soup and can easily see myself making this in the future – even off the SNAP Challenge.